The Nelson River winegrowing region in general, and Waimea in particular, have a growing reputation for aromatic wines. The Sauvignon Blanc from Waimea has become a popular alternative to the Marlborough style, essentially classical in its gooseberry, lime and capsicum aromas, with a flinty palate adding to the wine’s appeal. From the first vintage release of a trophy winning Sauvignon Blanc in 1997, Waimea Estates has attracted attention. The Nelson region boasts high sunshine hours which provide ripe fruit flavours and cool evenings which give a fresh natural acidity to the wines. The stony loam soils of the Plains, along with a moderating maritime influence and a protective phalanx of hills, create the perfect terroir to produce a wide range of grapes. This combined with the high quality viticultural management and skilled winemaking help produce an excellent array of quality wines. In 1993 the first vineyard of two hectares was planted, the Hill Vineyard. The 27 hectare Annabrook Vineyard was developed in 1993/4 and in 1995 the 8 hectare Hunter Vineyard was established. The 40 hectare Hope Block was planted in 1998. Over the winter of 2000 the eight hectare Packhouse Vineyard was planted. Colin’s Block was next in 2001, and then 2004/5 saw further plantings in both the Hunter Vineyard (now 20 hectares) plus a new location in Landsdowne Road (16 hectares). In 2006 another 20 hectares was planted in Colin’s Block. In total Waimea Estate now have over 130 hectares of vineyards. That’s a lot of vines whichever way you want to look at it! 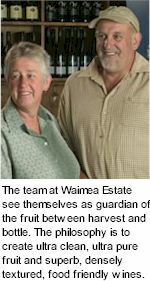 Waimea Estate see themselves as guardian of the fruit between harvest and bottle, just as the vineyard workers see themselves as guardians of the land (the property is managed according to the principles of Sustainable Winegrowing). After extensive experience the aim has become one concentration, texture and balance in the wines. The philosophy is to create ultra-clean, ultra-pure fruit and densely textured, food-friendly wines. The winery has certainly been innovative in its approaches to winemaking. 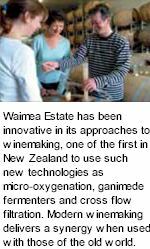 Waimea Estate were one of the first wineries in New Zealand to use such new technologies as micro-oxygenation, Ganimede fermenters and cross-flow filtration. Modern winemaking delivers a synergy with those of the old world. This is illustrated well with the Chardonnay and Pinot Noir. Both these varieties are wild yeast fermented. The Chardonnay is oxidatively handled and fermented warm with high solids. The Pinot Noir is destemmed only (not crushed), cool macerated and fermented hot with hand plunging. Extended élevage in barrel creates wines of finesse and elegance. Waimea Estate is also known for iconic sweet wines – a Noble Riesling that has won trophies with every year of its production, an auslese-style Late Harvest Riesling and, latterly, a very interesting (and highly awarded) Noble Chardonnay. Besides the Pinot Noir, a further red is made in limited volume: a Merlot Cabernet blend with attractive mocha characters and not a hint of greenness. A delightful Pinot Rosé is also made – from high-quality Pinot Noir grapes; the wine is unusually part barrel-fermented in lightly-toasted oak, giving a strawberries and vanilla cream character. The use of lees stirring is a distinct feature of the Waimea approach to aromatic wines – it is also used for Pinot Gris and Gewürztraminer. These last two wines have garnered significant interest due to their fruit-driven purity, their beautifully textured palates and their admirable balance and polish. Michael seeks to minimise unattractive phenolics by minimizing skin contact – the fruit is hand-harvested and whole-bunch pressed, and the juice has a very early press cut and is fermented with negligible solids. Fermentation is invariably stopped when the wine is off-dry, to bolster the palate with fruit sweetness. The only aromatic wine Michael does not use bâttonage on is the Riesling, where an approach of ‘less is more’ is taken. For the winery’s Dry Riesling clean fruit is very simply handled to focus the attention on pure fruit expression, while the slightly sweeter Classic Riesling is made more luscious through the inclusion of some botrytised fruit. Waimea Estates is committed to sustainable practices in both the vineyard and winery and have been accredited to Sustainable Winegrowing New Zealand (SWNZ) for some years now. This programme is based on three core principles: environmental soundness, social responsibility and economic viability. The programme was developed to: Provide a best practice model of environmental practices in the vineyard for winegrowers, with a scorecard acting as a reference document for growers through the season and from season to season. Provide quality assurance through an auditable production record from vineyard to winery. Address consumer concerns about the environment and winegrape production. Affirm New Zealand’s reputation for being a clean green country.